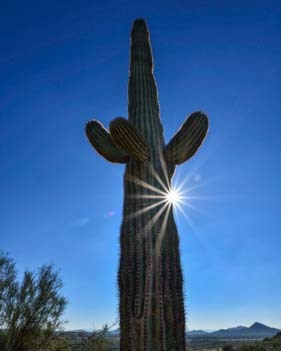 Phoenix, Arizona, is a huge sprawling city that seems to creep further out into the desert with every passing day. Each time we return to our old stomping grounds, we are surprised anew at all the changes. Roads we used to know like the backs of our hands now leave us utterly lost because we can’t find any of the old familiar landmarks. 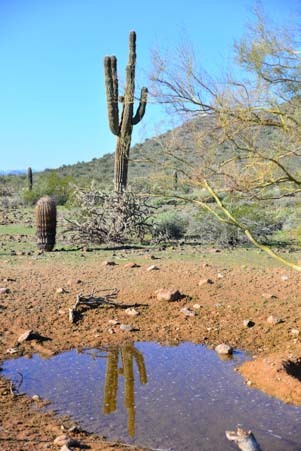 With that kind of growth, and with new construction gobbling up the precious Sonoran desert at a scary-fast pace, it often seems that there can’t possibly be any open space left for the leisurely enjoyment of nature. Everything within many miles of Phoenix has become either a master-planned community or a strip mall. 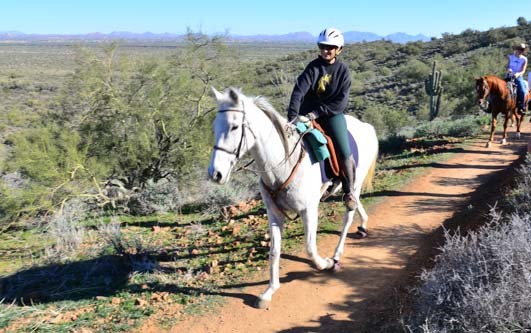 So we were utterly astonished when our friends Charlie and Cathie, who spend every free moment riding their bikes around town or hiking the many nearby mountains, asked us if we’d heard about the new road called Sonoran Desert Drive. In Phoenix? Impossible! We had to go check it out. Sure enough, this beautiful, brand new parkway runs between Cave Creek Road and Dynamite on its eastern end and Dove Valley Road and North Valley Parkway to the west, without a hint of housing or development or urban living of any kind except at the cluster of homes tucked into its far western end. 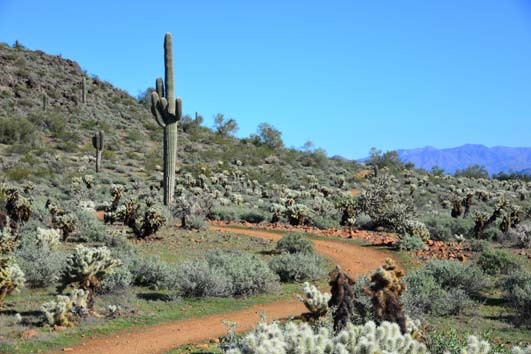 For about 8 miles, this parkway bisects a huge, square tract of open desert. Whoever knew that was there? When you are scurrying around the housing-lined city streets, zooming up this road and down that one, there’s no way of knowing what’s in back of it all. 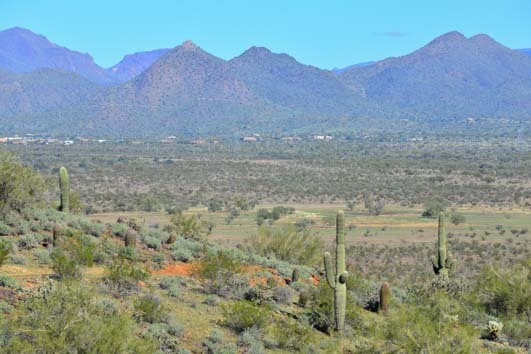 Better yet, right smack in the center of this vast piece of land is the brand new Apache Wash trailhead that is now part of the Sonoran Desert Preserve system. The first time we drove along this parkway and hiked the trail, in December, the trail had been open for just a few weeks. Groups of people with water bottles, hiking shoes, fanny packs and safari hats stood around in front of the brand new trail maps deciding which of the many choices of routes to try first. 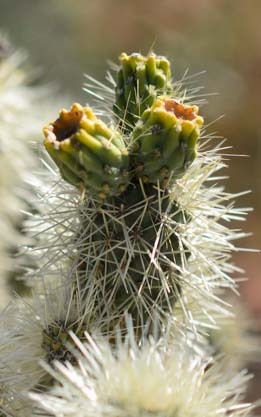 The hummingbirds need those long beaks to drink the nectar without getting spiked! Near the shade ramadas, a sun dial looking statue turned out to be a pointer system to the mountains in the distance. 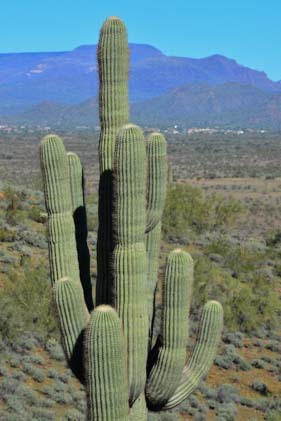 The McDowells, Four Peaks and other mountains that surround Phoenix at distances of ten to thirty miles could all be spotted by lining up the pointer. What a cool park! And what luck that we happened to visit just after a big rain. The air was as clear and crisp as could be, and the views to the horizon were haze free. We set out on one of the trails at random, and of course we didn’t get very far before we had to start taking pictures. 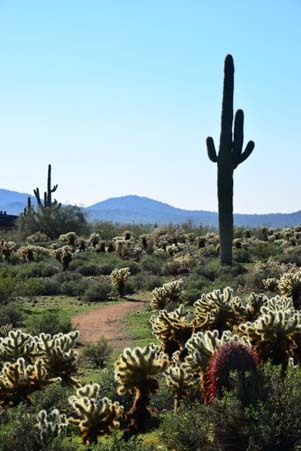 This is a lush part of the Sonoran desert, rich with saguaro cactus, ocotillo and the many scrubby low lying bushes that always blanket the desert in pastel shades of gray and green. 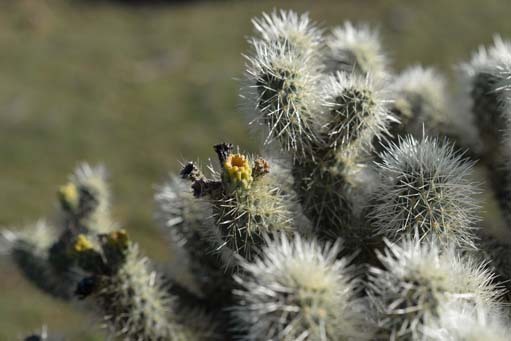 Jumping cholla, or “teddy bear” cholla (pronounced “choy-ya”), are the short, cute, pale, fuzzy many-armed cactus that look so cuddly. But if you get some skin, or clothes, or hiking shoes anywhere near their barbed needles, they will cling to you for all they’re worth. That’s how they got the reputation of jumping! …and they were all having a blast on the trail! If you step on one of their little round balls of needles that they shed so freely all around them, you will need a pair of pliers and a lot of patience to get all the needles out of the soles of your shoes! I looked up when I heard the sound of wheels crunching the dirt, and suddenly saw a mountain biker barreling down towards us. 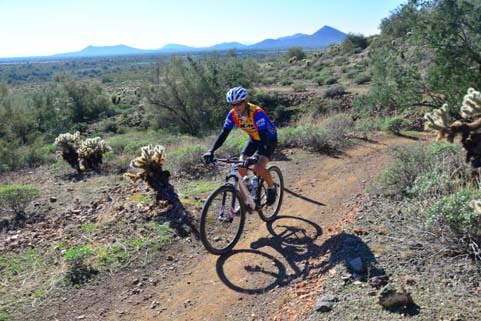 The trails are open to mountain bikers, and they all seemed to be loving their ride. 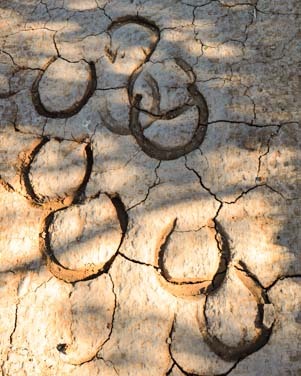 Horse shoe prints in the hardened mud. The trail snaked around the backside of a hill and made a gradual climb. 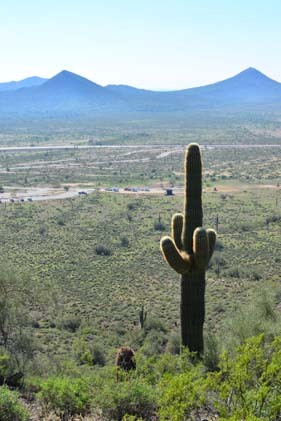 As we ascended, I was astonished to look out across the valley and see nothing but desert vegetation. 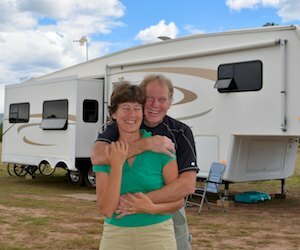 We were in the middle of pristine Sonoran desert, and there wasn’t a home to be seen except right along the edges of the mountains on the horizon. I heard a bird singing the most beautiful song. He was just chirping away in the warm morning sun. I finally spotted him sitting in the branches of a Palo Verde tree on the hillside. A horseback rider comes past. It wasn’t a song I recognized, and I switched lenses really fast hoping to get his picture. But my rustling around frightened him and he flew off. Or maybe it wasn’t the noise I was making…maybe it was the noise of the horses coming down the path! We had seen horse hoof footprints in the hardened mud, and we had seen horse trailers down in the parking lot, but it was still pretty exciting when they came walking down the trail and passed us. What a classic western image it made when they walked along the trail and off into the distance! How beautiful to watch the horses walk off the “movie set” scene into the distance! As we took a different route back and wound our way down the mountain towards the parking lot, I kept thinking how wonderful it is that a place like this has been built. 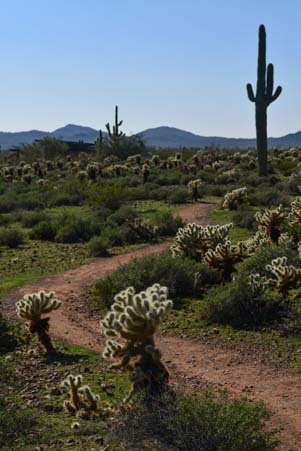 Later, a little online research revealed that this trailhead was funded in part by the neighborhoods that abut the land, and that the Sonoran Desert Preserve is still expanding. Just a week prior to our first hike there, another 600+ acres had been set aside. 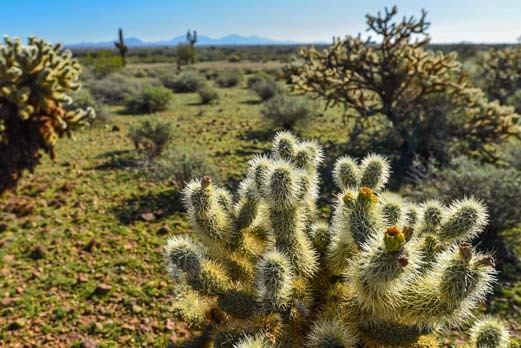 The Sonoran desert is a rare treasure that exists only in Arizona and Sonora, Mexico, and my heart breaks every time I see it being bulldozed for housing. Bravo to the city planners that decided to create this park, and even better still, to make it open and available to everyone. 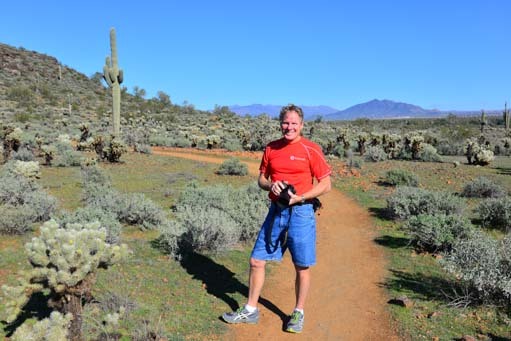 We have been enjoying getting reacquainted with the Phoenix area so much this winter — and we have been blessed with such unseasonably warm and sunny weather — that we’ll be sticking around a while and doing more desert explorations! 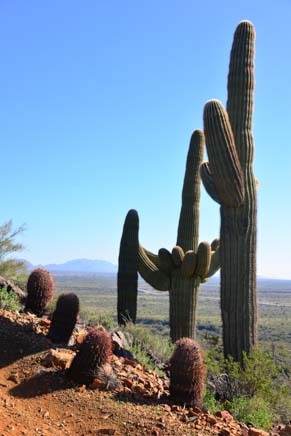 This entry was posted in Arizona and tagged Arizona, Arizona Central, Arizona Phoenix East, New, Travel, USA, WP Travel by Roads Less Traveled. Bookmark the permalink.